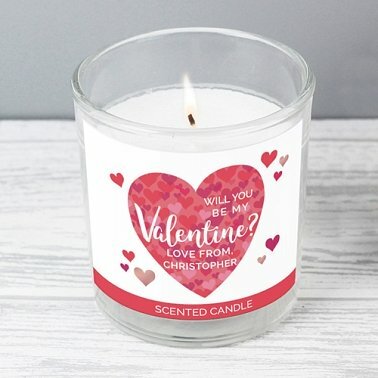 This Personalised Valentine's Day Confetti Hearts Scented Jar Candle is the perfect for a romantic night in! Personalise this scented candle with 2 lines of text, with a maximum of 12 characters per line. Please note all personalisation is fixed uppercase. The words 'Will you be my Valentine?' and 'scented candle' are fixed and cannot be amended. Burn time approx. 25 Hours.